Suniel Shetty’s daughter Athiya Shetty, who marked her Bollywood debut with Hero and then went onto do Mubarakan has been out of work since then until producer Rajesh Bhatia of Woodpecker Movies offered her Motichoor Chaknachoor alongside Nawazuddin Siddiqui only on his mere friendship but looks like her father-actor Suniel Shetty isn’t debted to the producer in return. As per the recent reports, Suniel has been constantly nagging the makers of the film and interfering in the editing process. He not only been creating issues for the film’s team but also asking the makers to edit various portions and arguing them related to Athiya’a screen time. 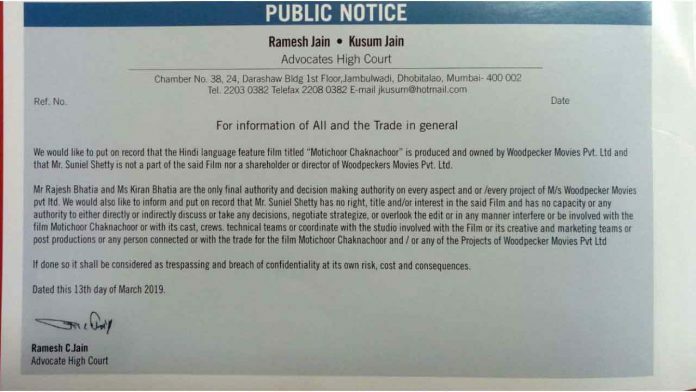 Owing to his behaviour, producer Rajesh Bhatia has now sent a legal notice to Suniel Shetty to refrain him from entering the film’s office and the production unit or any kind of creative interference. Looks like, father Suneil Shetty and her daughter-actress Athiya Shetty have created a pothole for themselves considering Athiya’s filmography isn’t too great but she still gets to pair opposite the talented Nawazuddin Siddiqui in an unusual wedding comedy by Woodpecker Movies. Previous articleKriti Sanon Believes That The Credit Should Be Equally Shared In The Business!